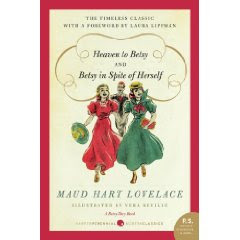 Heaven to Betsy (1945), Betsy in Spite of Herself (1946) , Betsy Was a Junior (1947), Betsy and Joe (1948) by Maud Hart Lovelace. From the library. What with all the editions, etc., available, I'm linking to Amazon's most recent ones but read much earlier ones. The Plot: Betsy Ray's high school years, from 1906 to graduation in 1910. The Good: I continue to love everything about this series. Betsy is hysterical; I love how she affects a stoop, er, droop, because she thinks it makes her look alluring. I love how Betsy isn't a star student in every subject; realistically, she shines in some areas, not so much in others. I love how Betsy is obsessed with boys; and to any modern parent shaking their head, thinking that is a modern concern, reread Heaven to Betsy. Betsy may think of most of the boys she knows as just friends, but she still wants them to walk her to and from parties and to come calling at her house. She yearns for a boyfriend -- cries over it, even. Did I mention the fanfiction? I mean, Betsy's fanfiction? In the article Carlie and I wrote for SLJ, we didn't get into RPF, aka Real Person Fanfiction. In Heaven to Betsy, Betsy takes an assignment to write an essay about the Puget Sound and turns it into a travel adventure story about herself, her friends and sister, and Enrico Caruso. I'm also impressed with how Betsy views her writing as more than a hobby. She isn't perfect; she drifts away from it, neglects it, gets over confident -- but ultimately never hesitates in viewing it as important. Her family also sees it as important; in fact, her family supports all their daughters that way. Julia wants to be an opera singer? They do what they can to make that dream a reality. In other things, Betsy is a teenager, a typical teenager, trying on different personas, not always honest about her own likes (books) or dislikes (skating), talking on the phone, worrying about her hair and clothes. As a matter of fact, while some of the references are delightfully turn of the century (shirtwaists! pompadours! ), remove them, add a cell phone, and you find a girl and her friends who would fit into today's world. Betsy gets in trouble for passing a note in class, and the teacher first humiliates her in class by reading it out loud and then sends her to the Principal's office. Her mother's reaction? The school was wrong. Yep; all those "oh noes" news articles about how parents today don't support the school and their darling is never, ever wrong and the good old days were better... Mrs. Ray proves you cannot make any assumptions about the "good old days" versus today. I almost forgot -- the Crowd! Betsy's mix of friends, boys, girls, some her class, some older, some younger. They're fun; I would love to hang out with them. And they're not perfect, but Lovelace doesn't preach about their missteps (the sorority), but allows them (and the reader) to come to their own conclusions. Plus, whatever the downside of the sorority flirtation, it also has its fun moments. Very true to life. I love that this is one story -- the story of Betsy's path from childhood to woman, figuring out her role in family, her relationships with boys, her own dreams -- told in four volumes. I love historical fiction; but I also love reading fiction written during the time period it is about, because I find a book written in the 1910s is more authentic and historical than the one written in 2009 about the 1910s. What is interesting about books like Betsy-Tacy is it's about the early 1900s written in the 1940s. When Betsy visits Tib (a trip Tacy's family cannot afford), she encounters on the train a "porter, a colored man in a white jacket". Later on, he brushes off her hat and travel coat before she departs the train. Today, in addition to not using the word "colored," there would have been more made of race. Also, the mysterious brushing off the clothes leaves the modern reader scratching their head. What the heck? A book written today would have over-explained that. And there is the scene where Tony sings in blackface; a modern book would explain it, if it was included at all. Lovelace just has it happen, revealing just how standard a practice this was; and how unobjectionable it remained in the time period it was being written. Much is told about the German immigrant experience and their contributions when Betsy visits Tib in Milwaukee. It's a beautiful and loving look at a pre-World War I America, when the immigrant experience was such that the immigrant's primary language remained the language of their home county. There is the modern (today) lesson here, for all those who say "learn to speak English, our grandparents did!" No, not always; Tib's family, second generation, spoke German. I cannot help but believe that Lovelace was also writing from the perspective of a person who had lived through World War I and II and seen how "the enemy" was treated and often demonized, and included the information about Milwaukee's German population not only because it was factual but also to inform readers that German Americans were Americans and "German" didn't mean "enemy." The Little House books have had much written about how the books were written, including a recent New Yorker article. As I further explore the world of Maud Hart Lovelace, I'm looking forward to learning the same things about her and her books (tho, honestly? While I love the LH books, I think I'd rather hang out with Maud than Laura and Rose). I like to wonder about what goes into the writing process of turning childhood into fiction. Compare Betsy Tacy, for example, to A Tree Grows in Brooklyn ; Betty Smith includes details that would not have been included in a book written for children. (BTW, one of my (many) pet peeves is people who think A Tree Grows In Brooklyn is a children's book.) I'm especially intrigued by the inclusion of Joe Willard in these books. Just a cursory look at the Internet shows that Willard was based on Lovelace's husband and his boyhood; yet Lovelace didn't meet her husband in High School. So I can't wait to read her biography and learn more of what she included, what she did not, what she changed, what she did not. If you have a particular biography or journal article to recommend, let me know. Like Little House, Betsy Tacy doesn't flat out point to negatives but rather the positives show the negatives. Nothing in the first four books mentioned bathrooms, toilets, outhouses, baths in tubs in the kitchen. When Betsy moves to a new, grander house with an indoor bathroom, we find out for the first time that in the old house there wasn't a bathroom. Betsy's family is "not rich" but it is clearly upper middle class. Like today's kids, who think of themselves as "not rich" but always have the money for a movie and ice cream and new clothes. And there are references to the bigger world with different lives. Betsy's father grew up poor. Joe Willard, Betsy's age, is living on his own, working, paying his own way and going to school full time. A friend's father dies, putting his schooling in jeopardy, making Betsy realize just how fortunate she is. As Betsy gets older and more aware of the wider world, we see a family that suffers huge losses. The music teacher's sister dies, leaving behind four children, three of whom die of an unspecified sickness (probably TB). Part of Betsy's growth is her growing awareness of people and lives beyond her own; so we don't learn about this family until Betsy is older. Vera Neville illustrates these books; loved them; disappointed I couldn't find more about her online. Next reads: the remaining two Betsy books and a biography of Lovelace. I also want to get my hands on Carney's House Party and Emily of Deep Valley, neither of which my library owns, so I'll be using their ILL for the first time. Liz, I have been learning about great new books from you for years now, but it's also wonderful to read your review of these books I practically know by heart! I love the "Adventure on Puget Sound" chapter as a BT connection to my home (Seattle), and now I'll always think of it as Enrico Caruso fanfic. Vera Neville: Teresa Gibson has researched her extensively, and I have a 2002 biographical email that Teresa posted on the MHL listserv that I will send to you. At the recent convention, I believe Teresa gave a presentation and Neville's niece was there to speak about her aunt's work. She also illustrated Winona's Pony Cart, in which you can see how she drew BTT as children. I own one non-BT book illustrated by Neville, Pigtail Pioneer by McDonald and Ross. My favorite quote about Betsy is from Laura Lippman: "I re-read these books every year, marveling at how a world so quaint - Shirtwaists! Pompadours! Merry Widow Hats! - can feature a heroine who is undeniably modern." Isn't she, though? I'm a middle school librarian. I spend a lot of time with teens. I know that many of them will enjoy the high school books and I am so excited about the reissues. Emily of Deep Valley is a joy. I envy you, getting to read it for the first time! It's so funny to read your comments on these books! I can't believe you'd never read them before (although I myself only read them when my Princess Diaries editor commanded me to because Betsy and Princess Mia had so much in common--not on purpose, since I had never read the Betsy books. Once I read them I realized what she meant though. Their problems--with friends, boys, and writing--are exactly the same!). "Betsy Was a Junior" is my favorite (it's the one I wrote the forward to, along with my 2nd favorite, "Betsy and Joe"). I hope you love those two as much as I do! Lastly--I've been to Betsy's house in real life! And Tacy's! It was completely mind bending. You have to go someday! Liz, I love your review and agree wholeheartedly. One of my favorite scenes is from Meg's favorite book -- I love when they stay up all night making the herbariums. I am such a procrastinator and so identified with that. I love the image of them stumbling around before the sun has come up, grabbing at whatever plants they can find and then drying them out in the oven to see what they really are. I can't wait to see what you think of Great World and Wedding. When I travelled in Europe for the first time in college, it was always with Betsy and her trip to the Great World in the back of my mind. As for Emily of Deep Valley and Carney's House Party, you'll be happy to know that they will be reissued in 2010! There is a book called THE BETSY TACY COMPANION by Sharla Scannell Whalen that is somewhat dry, but fascinating if you want to see the people on whom the characters are based. I've had a wonderful time reading your reviews of my favorite books and their author. Like one of the other commenters I suggest Sharla Scannell Whalen's biography of Maud called The Betsy Tacy Companion. Unlike that commenter I don't think the Companion is dry at all and have read it several times. I took it with me last month to Mankato (the real life Deep Valley) to the Betsy-Tacy Convention. I am still floating on air from the memories of the Convention. Being in Deep Valley and seeing Tib's chocolate colored house and being inside Betsy's house and Tacy's house was an experience I cannot describe. I have been reading the books since I was about 12 - nearly 40 years now - but only discovered others who love them as much as I within the last 10 years thanks to the Maud-L list serv. Thank you for your wonderful reviews. I am eager to see what you think about Carney's House Party, Emily, Great World and Betsy's Wedding! You wrote: "(tho, honestly? While I love the LH books, I think I'd rather hang out with Maud than Laura and Rose)." Exactly! This is true for me, as well. As others have said, I can't wait to hear what you think of Betsy and the Great World and Betsy's Wedding. I took GW along when I took my family on our first-ever trip to England & France this past spring. It's a book that meant very little to me as a kid, but as an adult has come to be an absolute favorite. I think it has truly inspired a number of people to travel abroad. Betsy's Wedding is, well, simply amazing. I may have read that book more often than any in the series besides BT and BTT. In addition to Whalen's book, I'd also recommend Julie Schrader's Maud Hart Lovelace's Deep Valley. It's true that it's more about place than people, but I found it fascinating and very helpful (especially if you're planning a trip to Deep Valley, as you should ;)). Once you read Carney & Emily via ILL, I think you should suggest your local library get a pre-order in on the upcoming releases of those two books! I forgot to mention that Teresa Gibson did, indeed, present an update on her Vera Neville scholarship at the 2009 BT Convention. It was fascinating program, and hopefully she'll be in touch to provide you with info. I'm Teresa Gibson, whose ears are burning from the comments above. The 2002 Vera Neville presentation which Laurie sent you does have a few errors, which I've corrected in the years since. You can e-mail me for more current information. I have not published this biography on the net yet. It needs a few more details researched and fixed before I can submit it for publication, but I would be happy to fill you in on what I know. Thanks so much for your beautifully written blogs on the Betsy-Tacy books. All the fans here can attest to their timeless appeal. I found your blog looking for reviews of The Queen of Attolia by MWT, and then came across this review. How fun! I read Betsy & Tib WAY back when- I think while in my Anne of Green Gables phase- and no one else had heard of it before. So I started to think that maybe I had dreamed the entire series up... but here you are, assuring me of its existence :-) Thank you! Wow, look at all the Betsy Tacy love!! Awesome. Thank you all! I still cannot believe I missed these as a kid. I keep on hoping, "oh, I'll read the next book and go DUH I DID read this one!" and of course, it's always awesome when Meg Cabot stops by. I just hope the house was clean enough and the tea hot enough. Or cold enough. Whatever you prefer.